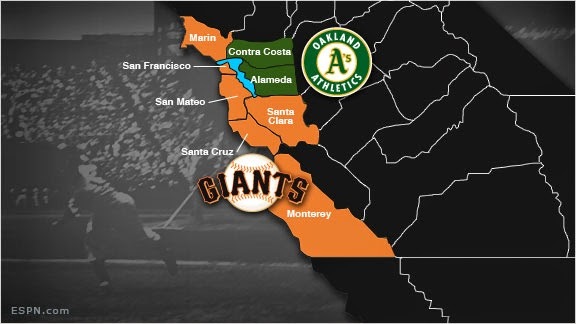 Having lived for over 30 years in the North Bay Counties of Sonoma and Marin, I have been a fervent Giants fan but when I moved to Contra Costa in 2010 for my work with combat vets with PTSD ~ I became swept up in Oakland A's fever and have now reached a healthy parity in my team allegiance but can offer a fairly objective analysis of their playoff chances in 2014. Oakland A's ~ What was once a fun loving group of over achievers led by power-hitting outfielder Yoenis Cespedes, Oakland was the team to beat by the All- Star break this year ~ but then Billy Beane (with visions of a World Championship in his eyes) got impatient, sold the soul of the team (Cespedes) to the Red Sox for proven World Series closer Jon Lester and watched the team slowly disintegrate through August and September. It is my opinion that Melvin and the Team were overruled on the Lester for Cespedes trade and that explains the recent slide in A's spirit ~ it was no longer fun but instead all business. But the final dagger in the heart for the stumbling A's happened on Wednesday, September 17th when bulldog Jeff Samardzija threw a brilliant 4 hitter through 8 innings against an obviously outgunned and bewildered Ranger team. Obviously Samardzija wanted to pitch the ninth but Manager Bob Melvin would have none of that and went with his already chosen closer Doolittle whose fast ball and slider was welcome relief for the young Rangers who pounced on him for six runs and the ball game. Doolittle knew it ~ "It's going to be a turning point one way or another," Doolittle told reporters after the game. "After the season's over, are we going to look back and point at tonight as the game where the wheels came off for good, or are we going to be able to pick ourselves up, dust ourselves off and talk about how resilient we are as a team and how we were able to overcome a game like this and still get it done?" Melvin's inability to recognize what everyone else, including myself and the ball players themselves (on both sides) already knew, that Samardzija was on a special roll and deserved to at least attempt to close the 1-0 game cast a "Why Try" spell on the A's and the wheels did indeed seemingly come off for good. Lester will attempt to right the ship against the Phillies on Friday, the 19th but the collapse seems complete and the fun Boys of Summer have become the burned out survivors of fall ~ destined to dwell on what might have been and what ever happened to those fun (double pie) times with Cespedes this year before Billy Beane pulled the plug. San Francisco Giants ~ Whereas the spirit left the A's it returned with a vengeance to the Giants ~ along with Angel Pagan, a rejuvenated team leader Buster Posy ~ and of course, their wily old fox manager Bruce Bochy. The Giants are making their every two year run for the money (having won the gold in 2010 and 2012) but realistically a wild card berth seems only likely this year. However, never underestimate Bruce Bochy in late September and October ~ he is a master motivator and big game strategist but it's unlikely he will take all the marbles this year. The problem is pitching and their nemesis the LA Dodgers ~ who are locked in first in the West and show no signs on relinquishing it to the Giants. The Dodgers are more individually gifted and of course have the best pitcher in baseball ~ Clayton Kershaw with 20 wins already in his belt. The Giants definitely have more team chemistry but that may not be enough this year. Winner LA Dodgers in seven games. And that's the way it appears to be ~ at least that's my prediction as a Bay Area resident and avid baseball fan whose allegiance is now split between the A's and Giants.